The Battlefield Center is the gateway to the historic Breakthrough battlefield. The building’s unique facade is evocative of the zig-zagging Confederate earthworks located a short distance away. Inside, the Battlefield Center houses a fiber-optic battle map, exhibits, theater, and interactive computer learning centers. 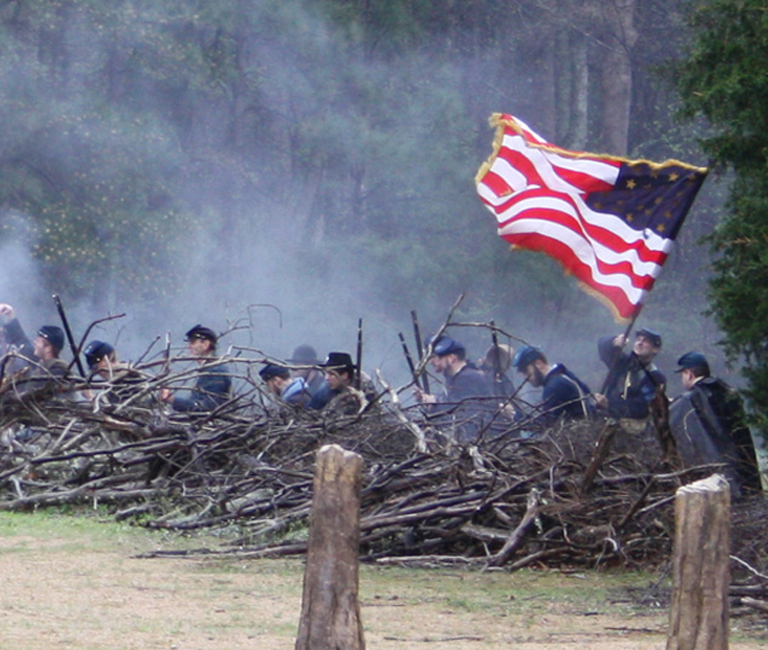 The 45-seat Breakthrough Theater showcases a multi-media presentation on The Breakthrough Battle of April 2nd, 1865. Perfectly suited for the seasoned Civil War buff as well as those with a broad general interest, the presentation features a battle map in motion, photos of some of the participants and of the landscape past and present. Hear the words of those who fought in the battle and come to appreciate and understand this critical battle that opened the door to Richmond for Lt. Gen. Ulysses S. Grant and his armies. The Battlefield Center houses a splendid collection of artifacts related to the Breakthrough battle that took place on this ground. Uniforms, regimental and corps flags, personal items, and photographs accompany relics that were unearthed from the battlefield. A fiber-optic map tells of the campaigning of the armies. A 3-D exhibit on the Petersburg Campaign shows almost two dozen photographs in their orignial three-dimensional format to tell the Petersburg story. A terrain map illustrates the features of the battlefield, highlighting the locations of roads and streams, plantation and farm houses on the land, and the locations of military fortifications constructed and maintained by both armies throughout the area. Commissioned by Pamplin Historical Park, “Medal of Honor” was painted by Don Troiani, Americas foremost Civil War artist. The painting showcases the heroic effort of Capt. Charles Gould, 5th Vermont Infantry, as he crested the Confederate earthworks the morning of April 2, 1865. During this Battle of the Breakthrough Captain Gould was the first man over Lee’s defensive perimeter around Petersburg. Captain Gould was twice bayoneted and slashed with a sabre. He received the Medal of Honor for his feat. The painting is now a permanent part of the Battlefield Center exhibit.